And so it has been with hundreds of public school teachers who discovered that when they criticized their school system, they experienced retaliation in the form of scurrilous attacks and physical threats. in Heaven's name WORK for him. stand by him and stand by the institutions he represents. but as long as you are part of the institution do not condemn it. and probably will never know the reason why. FINAL WORD from BILL FOIL. Paid for with private funds by Bill and his two friends. Foil even documented his attempt to deny Hall her First Amendment rights in numerous outrageous memos to the board. The covert attempt to punish her included the use of public funds to follow and photograph her—a well-planned conspiracy that included school board members and administrators, a minister, strangers, supposed friends, and fellow teachers. She was removed from her classroom and placed at the administration office without being allowed to tell her students good-bye. The State newspaper in Columbia gave Hall front page coverage as all the papers followed closely the unfolding saga. Hall’s daughter was threatened, vile messages left on their answering machine, and their dog stolen. "Q. I want you to focus on a date of December 5, 1990. Do you remember that to be the day that the first letter to the editor was written? A. I think that’s probably correct. Q. Prior to December 5, 1990, did you understand that Ms. Hall’s classroom performance was good? A. I believe it was recommended, observed by the principal and recommended each year. Yes. Q. Her contract was renewed every year in the normal course, is that right? After her victory in the US District Court of South Carolina (click here to read the US District Court of South Carolina's Decision), Marion School District 2 appealed. 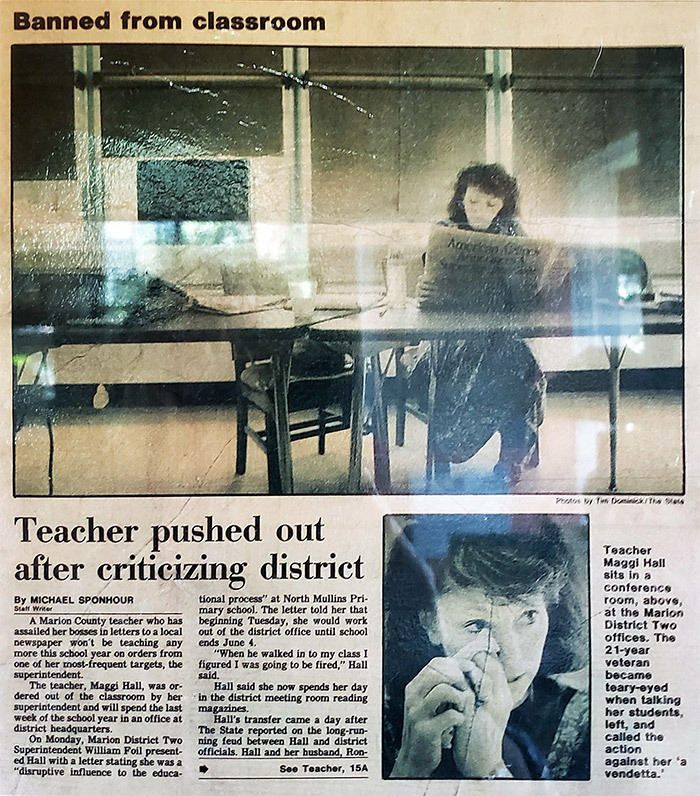 Hall refused to settle so the case then went to the Fourth Circuit Court of Appeals in Richmond VA.
Margaret S. Hall vs. Marion School District Number 2 was one of the most important First Amendment cases to be decided by the Fourth Circuit in over a decade (1994). It was unanimous, published, and extensive. Superintendents across the US were waiting for the decision. It stands today as CASE LAW to protect the rights of public school teachers as well as all public employees who speak out against their superiors regarding matters of public concern. Had the school district fought the Fourth Circuit’s decision the National Education Association considered the case so significant it would have appealed it to the United States Supreme Court (click here to read the Fourth Circuit Court of Appeals Decision). AFFIRMED: Teachers as Citizens illustrates Hall’s struggle to keep tax money where it belongs—for the education of our children. Her well documented book with significant footnotes has an appendix for those determined to become activists and whistleblowers. The word AFFIRMED, appearing as a one-word sentence on a separate line, is the final word in an opinion wherein the appellate court upheld the decision of the lower court.